I'm currently live blogging CII's Connect2009 conference from Chennai Trade Centre, Chennai. Connect 2009 is a premier ICT event hosted by CII, supported by Govt of Tamil Nadu and Ministry of IT, Govt of India. As an official blogger, my task is mainly to listen to the talks given by experts, make quick notes and publish a blog post giving summary of their talk, so that those who couldn't attend the event will stay updated. One particular talk I just heard sometime back was very informative, so I though I'll share with my regular blog readers. Rest of the posts are available in Connect2009 official blog. Below are the excerpts from a talk given by Ram Ramachandran, MD, TES-AMM India. Topic of discussion was Green IT. 90% of intrinsic value of a scrap lies in PCB. Globally PCB is a 50 billion dollar industry-though they meet all regulations set by govt agencies and electronic goods manufacturers, very little consideration is given to recycling. Precious metals like gold, found in house hold applications and other equipment, is classified into Low grade, medium grade and high grade. High grade gold is not available in India. Anyone setting up recycling unit finds it difficult to sustain unless he has access to high grade gold or can source scraps with other precious metals. This makes the recycling business very challenging. Also high grade gold shouldn’t be mixed with low grade gold, else the yield will be very low. In Europe, national laws exist to manage e-waste. Schemes exist wherein Producers and manufactures retake the product. Cost of recycling included in cost of product. However loopholes in the law are exploited often. ( for example PCB has only 2% lead-which is lower than the limit set for other products, hence it escapes the ban) Of the 1.2 million ton e-waste was collected, about 40% was exported- mostly to countries like India. USA: Recently 43 companies were warned for unsafe recycling practices, but no action taken. A draft bill was presented to fund R&D on e waste. Japan has a law -home appliance recycling law- consumer pays recycling cost when he disposes the waste. 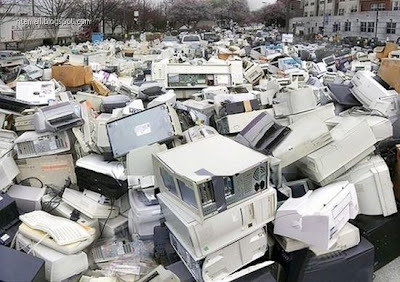 In India, Every gram of e waste is sold, all go on bidding war to dispose e waste. PSUs auction e waste. Informal buyers pay higher price as they don’t pay tax or bother to follow any regulation. However there have been no efforts to curb informal operators. Scrutiny is not applied to informal sector due to lack of willpower and manpower. Export requires special license, and overall, eWaste is not managed efficiently. 3 Companies should follow ethical practices while disposing waste, not just look for scrap value. Possible minor errors in interpretation, if any, is regretted. Actual title was different (Grow from Green-E waste etc), edited by me. Photo from an email forward. Thanks for sharing this. Legislation even if it would exist, we all know would be difficult to implement. Yes, majority of recyclers are small vendors- if they have to spend money on registration, compliance, eco friendly measures etc, they'd find it unsustainable to do business and continue to violate the norms, say by paying a bribe. oh God this is startling..i had no idea..
Great one. Thanks for sharing this. It is a nice article and gave me clear insights about e-waste industry. Appreciate your comments. why not leave a name? My name is Amrish Patel and We are know very well Electronic waste is very dangers for our health and for our environment so we will start a plant for dispose of Electronic Waste and dispose Electronic Waste and clean our environment. Our government should involve in this Electronic Waste matter and create and develop strict rules for the people and for the generated industries and we are the first active E-Waste disposal plant in Gujarat State and we are the Gujarat Government Authorized plant we have licence of disposal of E-Waste and we are the E-Waste recycler So If you have any electronic waste then sure you will give to us because we have good and very large plant in India at Gujarat State and we are doing final dispose with our government rules and norms because we are the authorization from Gujarat Pollution Control Board and if you want then sure we will give you certificate of dispose Electronic Waste. If you will want to contact me then you will call me on my cell no. 9825031734 or you will visit our website www.ecoliwaste.com. Do you have a website or something with more details? Will people disposing e waste have to ship it to Gujarath (cost of transportation would be more than scrap value)? Do you plan to build units elsewhere as well?